Home » Blogs » Is Sustained 5 Percent Annual Growth Possible? Is Sustained 5 Percent Annual Growth Possible? Because these promises diverge quite substantially from currently projected growth and from economic history, we view these claims as Largely False. 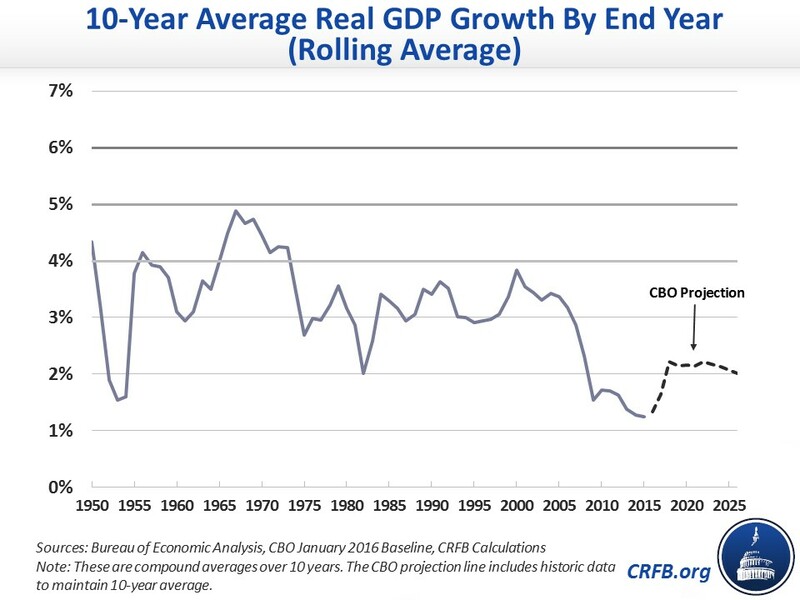 Currently, the Congressional Budget Office (CBO) projects that real (inflation-adjusted) growth will average 2.1 percent over the next decade. The Blue Chip projection, an average of more than 50 independent macroeconomic forecasts that vary by modeling method and assumptions, projects 2.2 percent growth. Looking at history, the average rate of US economic growth has been 3.2 percent since 1947. Future growth is expected to be about 1 percent lower than that due to slower labor force growth, mainly from unavoidable population aging. But even in periods with more favorable demographics, growth has never averaged 5 percent over a ten-year period. The record was 4.9 percent from 1958 to 1967 (due to recovery from the 1958 recession, Baby Boomers entering the labor force, and a tax cut in 1964). 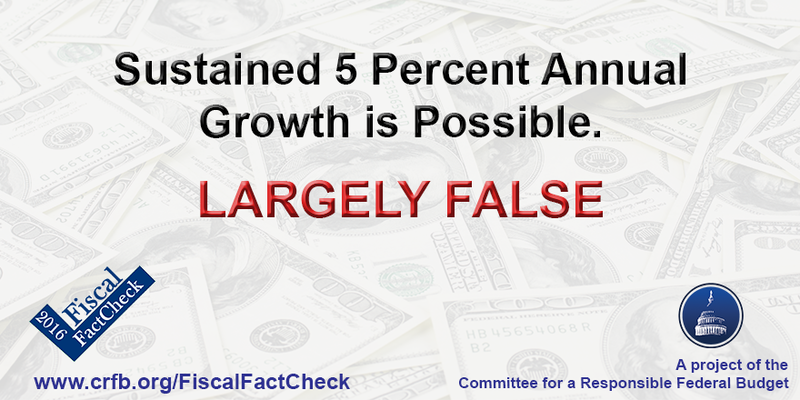 Since 1973, there has not been a 10-year period that has averaged 4 percent growth. The most recent example of a booming economy, the technological revolution of the 1990s, averaged about 3.5 percent growth. So how much could candidates reasonably expect to boost economic growth based on available policies? Adding together all pro-growth policies estimated by the official scoring agencies would at most increase annual economic growth to about 3 percent,* and that relies on all proposals being implemented without flaw and excludes any offsetting effects. That’s not very close to the 5 percent growth that candidates have claimed to get to. * Note: Tax reform will likely only be able to increase growth by 0.02 to 0.5 percent per year, according to official estimates of the Tax Reform Act of 2014 from the Joint Committee on Taxation and the Treasury Department. Repealing the Affordable Care Act could increase growth by less than 0.1 percent per year, according to CBO’s most recent estimate. The 2013 Senate immigration reform bill could increase growth by up to 0.3 percent a year, as estimated by CBO. A $4 trillion deficit reduction package would have positive economic returns of around 0.1 percent yearly on average over ten years, as calculated in CBO’s long-term budget outlook (and Sen. Cruz's and Trump's current plans would significantly add to deficits). These reforms in total could add about 1 percentage point to the 2.1 percent growth rate that CBO currently projects, bringing average growth to around 3 percent.